Around hearth and table Bards work their wonders, spinning tapestries of poetry and music, and keeping the memories of ancient days alive. Their ancient craft was born among the skalds of the Northmen, but now Bards can be found among all the peoples of the World. Every Bard must be a master of tale-telling and music, and must hone their memory to supreme heights: the great sagas and chronicles span thousands of rhymes, and can take three days to hear in full. A master Bard knows several great sagas, and can sing them through from end to end without missing a single word. They need no books or notes to keep the sagas: the weave of rhyme and kenning is their only guide, memory their only tool. 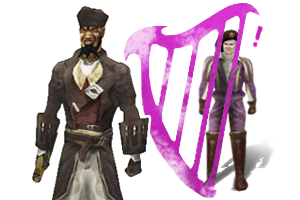 The Bard is a support class focused on the aural arts to bolster his group. His melodies, redes, and songs harmonize into a symphony that will invigorate the most meager of allies. He can increase resistances, stats, and regeneration rates while also dispelling effects and applying potent crowd control through his various powers. His ballads can even make his allies impervious to damage and effects. The Bard is the premiere support class; however, a group rarely benefits from more than one. Because of this, the Bard will often find himself as a high-priority target and must evade enemy onslaughts while supporting his group. Fights are often won or lost on the back of the Bard power so, despite its image, this class is not for the faint of heart. Between Shielding, Anthem of Avoidance, Defensive Stance, the resistance songs, and resistance enchantments your gear it is very possible, and encouraged, to get extraordinarily high resistances on a Mage Bard. Keeping yourself stun immune via prestunning is vital! One landed stun, if it is not immediately dispelled, is likely to be your death. You can keep yourself stun immune with Mage's Stun power by recasting it on yourself while the immunity is still up, thus refreshing your immunity. Keeping up your melodies, redes, and songs can be pretty passive so, in addition to debuff stripping with Mighty Countersong, a good Mage Bard can also handle tossing out crowd control onto targets and keeping high-value debuffs, like Shadow Mantle, buried on a target with Weakening and Enfeeblement. They are normally outclassed by their Mage counterparts in large group fights but Dodge, light armor, and high defense can make Rogue Bards potent in smaller fights. Take advantage of that in your builds. 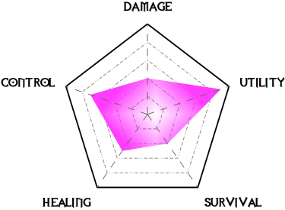 Some people build them more offensively, and the power rank for various weapons allows them to be pretty potent in a fight. With these type of builds, an effective strategy is to use Countersong to slowly strip your opponent's buffs away. Although one would normally not think this the case, Rogue Bards are less tanky than their Mage counterparts so it is vital that you keep debuffs off of you that negate the defenses and mobility you do have such as defense debuffs, exposes, and crowd control effects. Be judicious with your Mighty Countersong. This page was last modified on 6 February 2018, at 12:06. This page has been accessed 236,015 times.